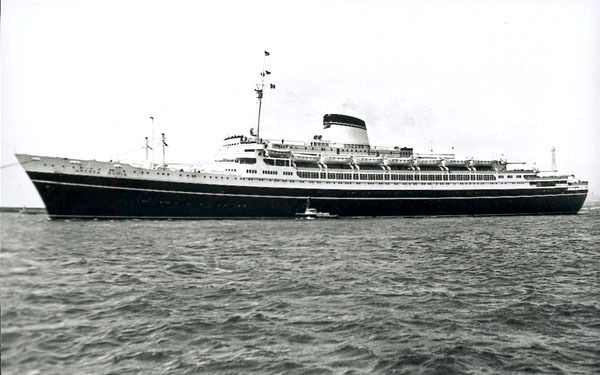 The fine new Italian luxury liner Andrea Doria, the “Grande Dame of the Sea,” enjoyed popularity from the day it was launched in 1953 until it was sunk in a collision off Nantucket Island on July 25, 1956. For those three years, the 697-foot-long Andrea Doria was touted as the largest, fastest and safest of new passenger liners on the Atlantic crossing. It boasted eleven watertight compartments with bulkheads extending from A-Deck to the double hull. Thus, like the Titanic before her, the ship was considered unsinkable by her builders. She also was equipped with radar so it could be warned of nearby vessels, even in fog or dark of night. All of these safety features were built into this great liner, yet the Andrea Doria was destined to become the last great liner to be lost near the end of the era of Atlantic crossings by sea. On its final voyage the Doria, with Captain Piero Calamai at the helm, was near the end of a nine-day voyage from Genoa to New York with 1,706 passengers and crew. The other ship involved in the collision was the Stockholm, a 528-foot-long Swedish liner, under the command of Captain H. Gunnar Nordensen. The third element in the disaster was fog. Even though a thick fog hung over the coast that day the Stockholm steamed away from New York harbor at a full 18 knots. Third Officer Johan-Ernst Carstens-Johannsen was standing watch on the bridge. Meanwhile the Andrea Doria was approaching that busy harbor, also running at a high speed of 21.8 knots. Because of the fog Captain Calamai had ordered the ship’s speed reduced from 23 to 21.8 knots, the ship’s watertight doors closed and the foghorn to blow. A crew member was stationed as a lookout.Seeing the radar image of another ship yet some distance off, Calamai changed to a more southwestern course to avoid it. Meanwhile, Carstens-Johannsen, who was not in fog and did not see the approaching liner, believed that a strong current was causing the Stockholm to drift north of its course. Consequently he ordered a southerly course change, thus putting the two liners on a collision path. As the two ships drew closer, the Doria’s crew watched the Stockholm speed right toward them. The Doria’s radar, however, told the crew that the ships were on course to pass safely starboard-to-starboard. Because of the radar information, Captain Calamai chose to steer to pass the approaching vessel starboard-to-starboard even though this was a violation of the rules of the road for ships at sea. He said his decision was based on the belief that they were already approaching each other at starboard and a port-side passing would mean crossing the bow of the other ship. So with the other ship only about three nautical miles off, Calamai ordered a four-degree course change to port. Just at that moment the Andrea Doria emerged from the fog bank and the two ships suddenly were visible to each other. On the Stockholm’s bridge, Carstens-Johannsen ordered his helmsman to make a sharp turn to starboard to give the oncoming ship a wide berth. He did not expect the Andrea Doria to be running for a starboard-to-starboard pass. Thus he turned his ship right into the side of the other liner. Steaming toward each other at full speed, the bow of the Stockholm sliced through the Italian liner’s starboard hull just aft of the bridge, cutting through seven of the ship’s 11 decks. The hole reached almost to the ship’s keel. The moment the two liners tore apart, their engines still running at full power, the Andrea Doria took on so much water she began to list in minutes. The force of the collision killed passengers and crew members working and sleeping at the point of impact. One passenger, Thure Peterson, who survived but lost his wife, said he watched the Stockholm’s hull slide past him. Had he been a few feet closer to his wife, he also would have been crushed. Of the 1,662 souls on the Andrea Doria that fateful day, only 52 lives were lost. All of them are believed to have been killed during the impact, or from flooding below decks. Some passengers were removed by the Stockholm, which pulled alongside in spite of the massive hole in its bow. The Stockholm was not in a sinking condition and managed to make it safely back to port. Then the liner Ile De France arrived on the scene and removed the rest of the passengers and crew. They said the Ile De France circled the fast-sinking Andrea Doria three times and dipped her flag in a final salute before steaming off with the rescued survivors. It took the big liner about eleven hours to sink, so newsmen and camera crews had time to get to the scene in time to get shots of the vessel in various stages of foundering. By the time it sank, the world was watching on television or listening to live radio commentary as the liner slipped under the waves and settled in 225 feet of water at 10:09 AM the next morning.